"Now there’s an idea. Maybe that’s what this is: the universe taking sides, trying to kill the other team." "Matter is all one thing, in endless variety." "And the Darkness? Is it part of that same one thing?" "No. Matter is one. Darkness is zero." — Hunter and 99-40 Frame. 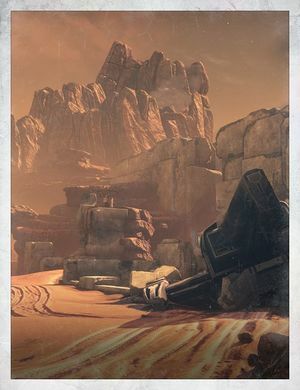 Bastion is a Crucible map located in Meridian Bay on Mars. In the distance, three large Cabal artillery cannons can be seen firing near a formidable Cabal base. The vehicles flying in formation above are responsible for generating the bright drive flares that can be seen in more detail nearer to the Cabal base. Perhaps the design and seeming constant readiness of these craft holding station, might imply that they are an attack craft of sorts or are intended to be used for area denial like a barrage balloon, providing further insight into Cabal military doctrine. The area is the site of an intense battle between the trespassing Cabal and the defending Virgo Prohibition. Several destroyed Goliath Tanks litter the area, showing how well defended it was. Whatever the Vex are protecting down in the labyrinth must be a great find indeed. "There's no telling the scale of devastation hidden beneath these red sands." Thick, rugged terrain masks one of the largest Vex structures on Mars, leaving this imposing gate as the only conventional entrance. With the Cabal's interest in Vex activity, it was a matter of when, not if, they would set their sights here. The Cabal deployed a massive ground and air offensive to breach the wall and enter the subterranean labyrinth. We don't know what the Vex deployed in defense, but we know this: the Cabal didn't make it very far. Vex have since mysteriously vanished from this region, giving the Crucible one of its largest arenas in the solar system. The Cabal, on the other hand, still prefer to keep their distance.